by Gitman, Lawrence J.; Zutter, Chad J. 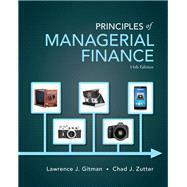 -- &>Principles of Managerial Finance, Fourteenth Edition, Gitman and Zutter guide you through the complexities of finance with their proven learning system. Teaching and learning aids are woven into concepts and practice, creating a roadmap to follow through the text. Several features–including Why This Chapter Matters and Personal Finance Examples–show the value of applying financial principles and techniques to everyday life. Lawrence J. Gitman is an emeritus professor of finance at San Diego State University. Dr. Gitman has published more than 50 articles in scholarly journals as well as textbooks covering undergraduate- and graduate-level corporate finance, investments, personal finance, and introduction to business. He is past president of the Academy of Financial Services, the San Diego Chapter of the Financial Executives Institute, the Midwest Finance Association, and the FMA National Honor Society. Chad J. Zutter is the Joseph P. and Angela A. Campolo Faculty Fellow and an associate professor of finance at the University of Pittsburgh. His research has a practical, applied focus and has been the subject of feature stories in, among other prominent outlets, The Economist and CFO Magazine. His papers have been cited in arguments before the U.S. Supreme Court and in consultation with companies such as Google and Intel.